Governor Susana Martinez, pictured with sign, joins children from the Carlsbad Municipal Schools and area dignitaries this morning in the Fourth Annual Walk Against Child Abuse event. The walk began at the Carlsbad CYFD office and ended at the Eddy County Courthouse, where brief presentations were given by Carlsbad Mayor Dale Janway, state representative Cathrynn Brown, and district judge Jane Shuler-Gray. 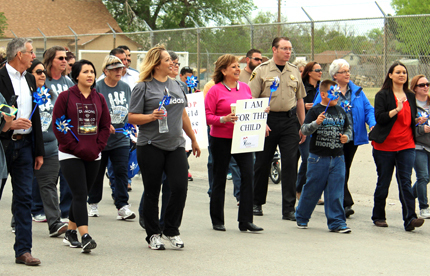 The event, sponsored by CYFD, Eddy County CASA and the United Way, is intended to help raise awareness of child abuse and encourage people not to remain silent when they know or suspect it is occurring.